Get your order form now! 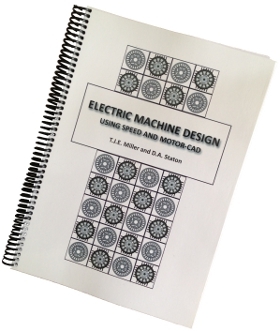 In this book two of the most experienced authors in the field have come together to present a practical guide to the design of electric machines using the SPEED and Motor-CAD software packages. These were written to work together; one for the electromagnetic and the other for the thermal aspects of motor design. Ten different machine types are introduced in the book, starting in each case from a simple specification and proceeding through to a credible prototype. Rules of thumb and basic engineering principles are used throughout to guide and inform the design process, and reference is made to the extensive documentation of both SPEED and Motor-CAD for a deeper theoretical understanding. The book has been used and tested in training classes in the United States, Japan, and Germany. It can be used as a course text, either in intensive sessions covering up to 10 days of instruction, or as a self-study text in conjunction with the SPEED and Motor-CAD software. The wire-bound format ensures that Electric Machine using SPEED and Motor-CAD sits comfortably on the desk beside your computer, and can be easily updated as the software itself develops. Chapter 2 Brushless DC Permanent-Magnet Motor with Squarewave Drive. Chapter 3 Interior-Permanent-Magnet Motor (IPM) with Sinewave Drive. Chapter 4 Synchronous Reluctance Motor with Sinewave Drive. Chapter 5 3-Phase Induction Motor. Chapter 6 Single-Phase Induction Motor. Chapter 7 PM DC Commutator Motor (Brush motor). Chapter 8 AC Universal Motor. Chapter 9 Switched Reluctance Motor. Chapter 10 Salient-Pole Wound-Field Generator.